The Locke Residence is a 1,300 SF residence in Hudson Heights. In this Design/Build Project we collaborated with architect John Locke, working hand in hand, using an integrated project delivery approach which allowed us to complete the project on different phases with a craftsman level quality to the space. The bright and spacious condominium is in a 1920’s 6 story building with unique views of the George Washington Bridge. The eclectic home features an ample living room with a double door opening toward the adjacent dining and family rooms for entertaining, in addition to a study and bedroom with a walk-in closet. 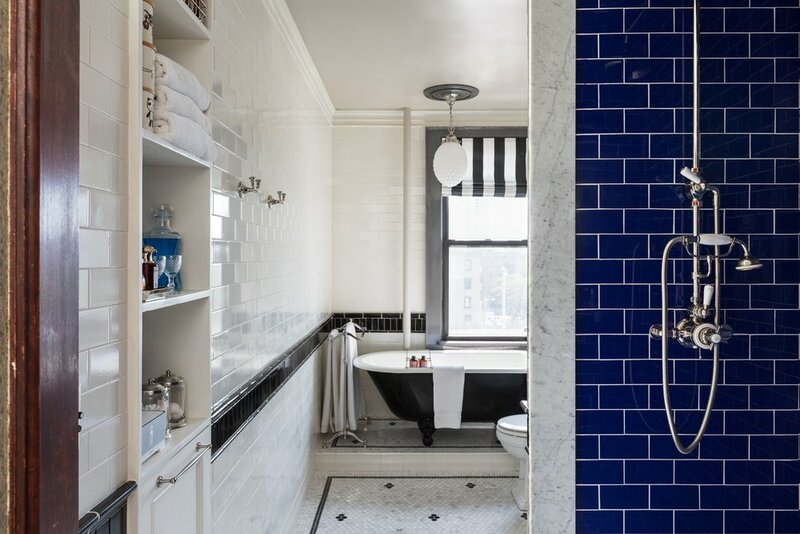 Drawing on the clients’ design and editorial backgrounds, the space uses contemporary graphic accents, patterns, and textures; highlighted with classical custom wood moldings and lighting fixtures, all set against deep blues, natural wood and white toned backgrounds. We provided Interior Design, featuring the work of contemporary artist David Roman; as well as Construction, Management and Owner’s Representation Consultancy providing expert cost estimating and detailed project supervision.